Magazine design is one my passions and my last semester at Baylor I worked as the co-editor of the Focus Magazine, a Baylor student publication. My role as co-editor was designing the full 32-page spread for our theme, State of the Art. This issue focused on the upcoming art scene in and around Waco, Texas and features some of the most talented persons in the community from insect collector Professor Greg Lewallen to Clint and Kelly Harp from Harp Design Co. (famous from HGTV’s Fixer Upper), an interview with National Geographic editor and Baylor alum Janna Dotschkal to famous poet Robert Browning’s stained glass window collection in the Armstrong Browning Library. Feel free to check out the full online magazine on issuu and the step-by-step process of designing the magazine here. 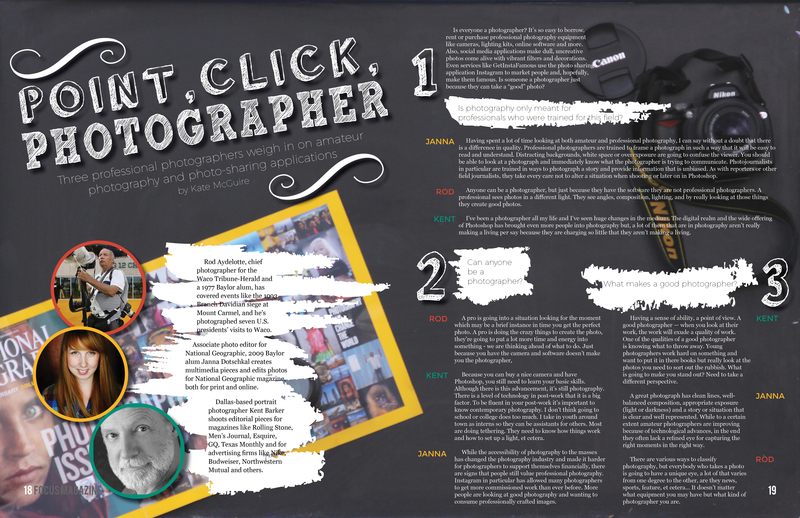 Check out my story for State of the Art, Focus Magazine Spring 2016 issue: Point, Click, Photographer which I interview three professional photographers who give insight on the question, is everyone a photographer? Photographers include Rod Aydelotte who was the on-site photographer/videographer of the 1993 Waco Siege and chief photographer at the Waco Tribune-Herald, Janna Dotschkal, Baylor alum and associate photo editor at National Geographic and Kent Barker, a Dallas-based editorial photographer who has worked for magazines like Rolling Stone, GQ, Esquire and advertising firms such as Nike and Budweiser. Spring semester 2015 I worked as a writer for the Focus Magazine issue, Deep in the Heart. This was my first time writing a food piece but, it turned out to be really fun and exciting to learn more about central Texas sausage industry and get to meet the people who take such pride in their family businesses. Check out Savory Smokey Sausage in the online magazine. 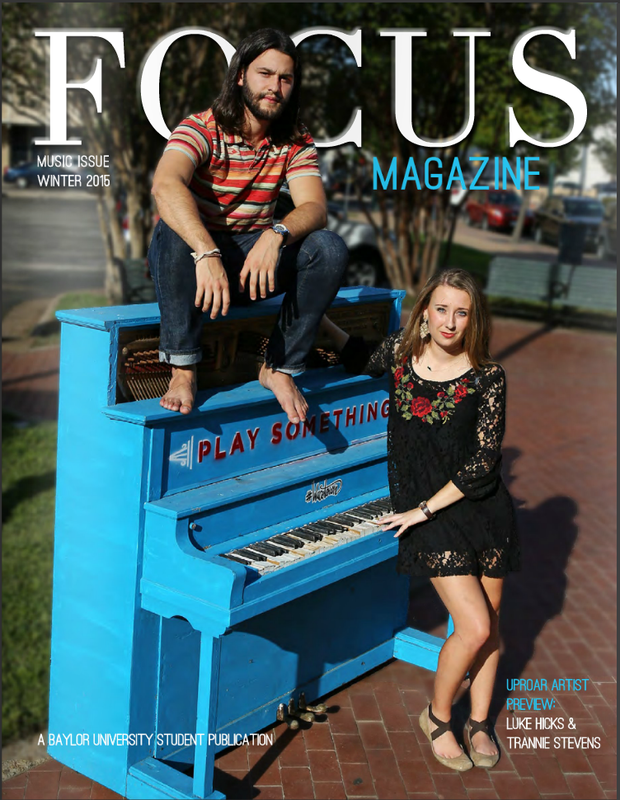 Fall semester 2014 I worked as the Assistant Editor of the Focus Magazine where I helped the Editor-In-Chief, Marissa Marak create the music issue. My involvement included rewriting older versions of stories, editing photos, and writing a piece for the magazine. Feel free to browse the full online magazine. The story I wrote for the Winter 2015 issue of Focus Magazine is called The Golden Wave Band and focuses on the 2014-2015 Golden Wave Band’s drum majors and the hard work they put into their job. You can find the full story on the online magazine.